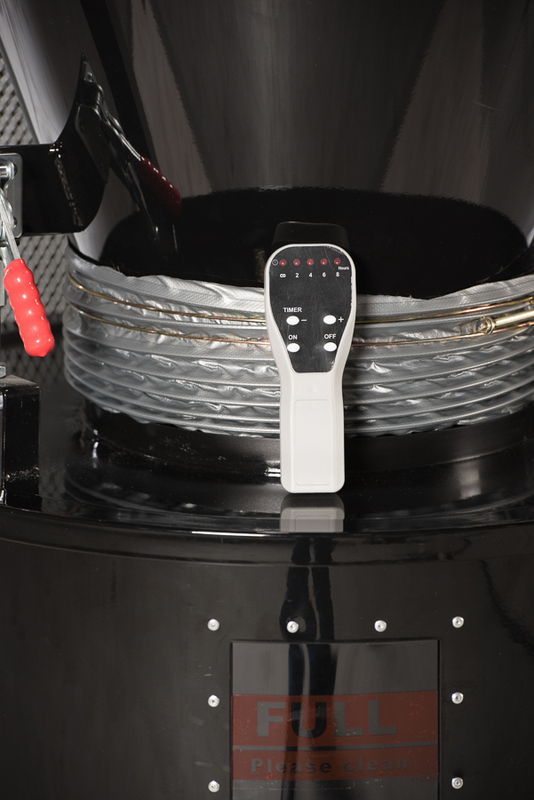 The CWI-DCP030H is a 2100 cfm portable cyclone dust collector with a 3 HP/15 amp 220 volt motor with a magnetic safety start switch and remote start/stop control. A cyclone dust collector is designed differently than standard single stage dust collectors in that the cyclone does not allow the dust particles to travel through the impeller. On single stage collectors the impeller draws the dust through it and then pushes the dust through to the filters. A two stage (cyclone) dust collector pulls the dust into the cyclone area of the machine and forces the dust downwards straight into the metal dust storage drum. Only the very very fine particles of dust can travel into the impeller and then through to the filtration. Because almost 100% of the dust never actually gets to the filtration area the filters stay very clean for much longer periods of time. With a single stage collector the dust not only fills up the cavity of filtration it also quickly dirties the filters causing a reduction in the flow of air until emptied and cleaned. The cyclone dust collector (two stage) remains very efficient with virtually no disruption of air flow. 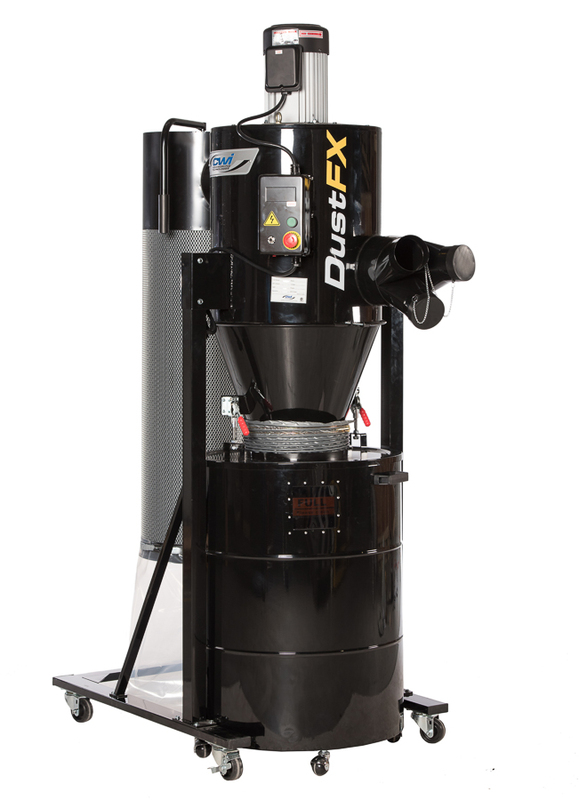 In addition to the efficiency of the cyclone process the CWI-DCP030H also features a very high performance “Hepa” manual clean canister dust filter. Advanced performance Hepa filtration will filter out 99.97% of dust particles .3 micron and 100% of all dust particles .5 micron and larger. To clean the canister filter simply move the cleaning handle a few rotations upon completion of each use. Attached to the Hepa canister filter is a small plastic bag to collect the very fine dust particles that do make their way to the filtration compartment. This bag will get emptied very seldom while the metal dust drum attached to the cyclone area is a breeze for dumping regularly. The metal dust drum is attached to the cyclone by two clamps that securely seal the drum to the cyclone. The 62 gallon drum is on four multi-directional casters for easy movement around the shop. Inside the drum is a plastic dust bag which can be reused or disposed of when full. A unique metal frame is placed inside the bag to stop it from being sucked up into the machine till the bag starts to fill with dust. For dumping simply release the two lever clamps and roll out the drum, pull out the bag frame and then dump the bag of dust into your receptacle. The CWI-DCP030H is built with our exclusive structural steel frame which makes assembly a breeze and travels on four heavy duty multi-directional casters. 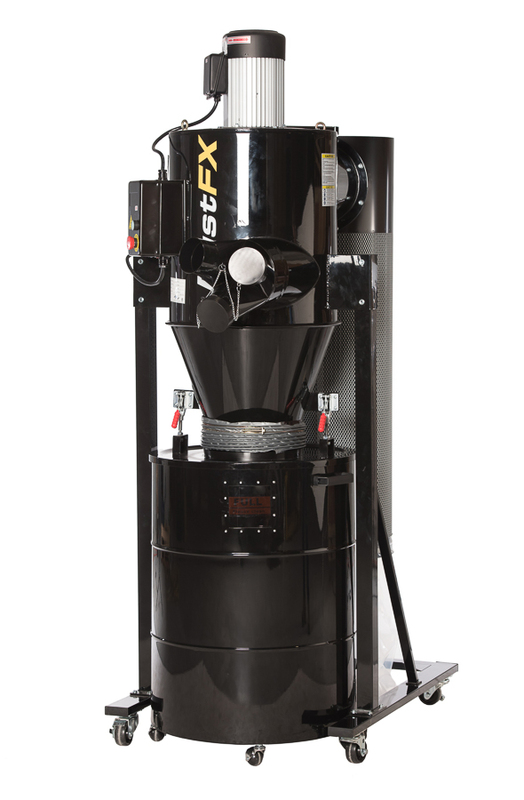 There is an 8” dust inlet with an adaptor to three 4” dust inlets included with the machine. Sound level is only 82db at 10 feet from the machine.